Following the 65th AGM, members of Hebden Bridge Local History Society were treated to a sample of some of the treasures to be found in the Society's archive. Frank Woolrych told the story of how the Birchcliffe Baptist Chapel, celebrating its 250th anniversary, eventually became home for the History Society Archive and the Pennine Horizons Digital Archive. Some of the nineteenth century photographs now held at Birchcliffe showed the rapid development of the hillside where the first chapel was built. By 1898 when the present Birchcliffe Chapel was completed, the views across the valley were often obscured by smoking chimneys. This magnificent building was threatened with demolition after it closed in 1973, but was saved by Pennine Heritage and provided a home for the Alice Longstaff photograph collection, which was gifted to the organisation by Frank. 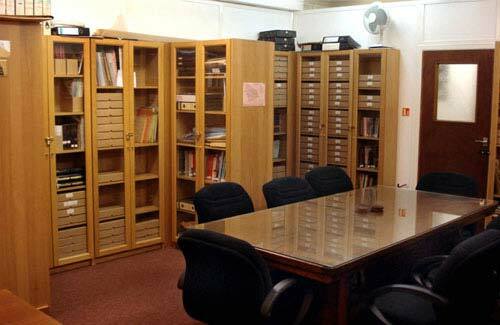 Meanwhile, the Hebden Bridge Local History Society's growing and valuable archive had been searching for a permanent home, and found a safe resting place at Birchcliffe, in the refurbished board room. Both the archives have gone from strength to strength. Diana Monahan gave an indication of the fascinating facts that a search of the archives can uncover. Running through seven hundred years of anniversaries, and with illustrations mostly from the Society's own collection. These included the arrival in 1764 at Wainsgate Chapel of the Reverend John Fawcett, who penetrated the 'unintelligible dialect' and continued to promote the education of young men of the area rather than advance his career elsewhere. In the same year the bankruptcy of John Parker of Shackleton, whose adventures with the Cragg Vale Coiners are also recorded. Photographs track the development of the townscape, but it is often the ephemera, like the postcard from the Village Blacksmith with a cartoon sketch of an unwilling horse, that put us in touch with lives long gone.